When you tour a newly built home, the pristine look and fresh smell of baked goods can be a seductive combo. It’s easy to get caught up in the moment and forget the serious financial commitment that comes along with your precious breakfast nook. Keep a cool head, put down the cookie, and remember that it doesn’t matter if you’ve found your dream house if you can’t afford the mortgage. The right resources can help you determine how income, debts, a down payment, debt-to-income ratio, interest rate, loan terms, taxes, and insurance factor into your final buying price. Below we’ve rounded up our three favorite calculators to help you estimate your payment, followed by our our 5-step guide for gathering the financial information you need to determine how much mortgage you can afford. This 10-year-old real estate resource is a leading destination for anyone looking for home prices, buying advice, and selling tips. The Zillow home affordability calculatorcan break down payments to show you – at a glance – how much will go to home and how much will go to interest and extras. 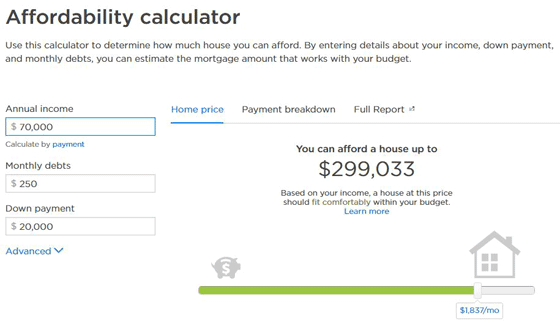 Zillow’s Affordability calculator helps you determine how much house you can afford, based on your income, down payment, debts, and more. This SmartAsset calculatortakes your location into consideration when calculating how much house you can afford. Local home values, tax rates, and the current market all factor into the final numbers for your expected mortgage price, closing costs, and type of home you could buy. Bankrate’s reliability as a personal finance hub has made it a popular stop for financially savvy people. It has a variety of calculators, including the Bankrate new house tool, which takes a detailed look at your income and expenses. Alimony, taxes, debt obligations, and car payments are just a few of the expenses that go into tabulating a personalized mortgage number for you. Now, let’s jump into the five steps for calculating additional factors and expenses to see how much you can afford each month on a more granular level. Do not include utility bills, groceries, or other non-debt items. Total up your monthly amounts and use this total monthly debt payment for the next step. Your ideal total should be less than or equal to 36%, though some government-backed loans may accept a DTI of up to 43%. How much can you put toward the cost of your home right this very minute? This cash amount is referred to as a “down payment,” and it can have a significant effect on the terms of your mortgage. This amount will need to be at least 3.5% of the mortgage, so the less you can afford to put down, the less house you can afford. A higher down payment can lower your monthly payment and even reduce what you pay for private mortgage insurance (or PMI). Paying more now is always a good way to make sure your mortgage isn’t a burden later. While the joy of ownership is a reward in itself, there are some other perks to having a mortgage that shouldn’t be overlooked. You can usually deduct your mortgage interest from your taxes, for example. You may also be able to cut your IRS bill by deducting your property tax payments! We recommend MortgageCalculator’s guide to homeownership taxes for an in-depth look at your tax options and considerations. You should already have a good idea of your credit profile before you jump into applying for a home loan. The better credit score and history you have, the more likely you’ll be to qualify for lower home interest rates and a lower down payment. Because both of these will ensure more of your money goes to pay off principle, you can reduce the overall price you pay for a home, saving money for other expenses like home improvements. 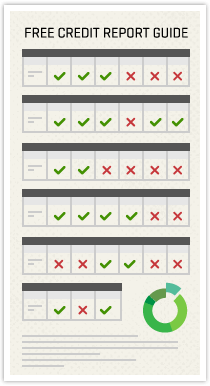 You can get your credit reports for free at annualcreditreport.com, but that doesn’t include your credit score. When making such a large and important purchase, it’s important to know your actual FICO Score, the score used in 90% of lending decisions. It’s healthy practice to check your credit scores and reports at least once a year to stay up to date with your finances. Once you gather all of the information above in each of the five steps, you can go to a lender and get a mortgage pre-qualification. This is essentially a bank telling you how much house you can afford (not to be confused with a pre-approval), and can be done easily online at no cost to you. The above lenders even work with bad credit, so don’t be discouraged. Our experts have reviewed and rated each service to provide you with the best options. By being prepared before you start looking at homes, you can greatly reduce the chances that you’ll get your hopes up on a house you can’t afford, and these five steps can help guide you to the right neighborhood.